How online networks are revolutionising political activism in the digital age. The above photograph was captured by Glenna Gordon – an American photographer and journalist – at the Sudan-Congo border during the 2008 peace talks while she was on assignment for the Associated Press. It shows the founders of Invisible Children — Bobby Bailey, Laren Poole, and Jason Russell — posing with guns alongside members of the Sudan People’s Liberation Army (SPLA), who have fought against the LRA. Overall, this image is indicative of one of the main points of criticism of Invisible Children’s campaign – the idea of US military intervention as a solution to the Ugandan situation. More this issue can be found here. 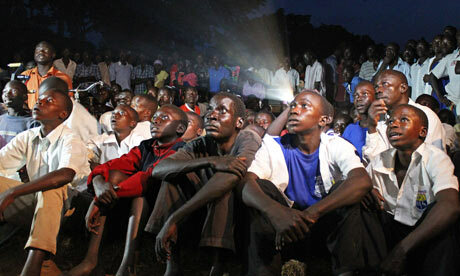 The above photograph was taken by AFP/Getty Images and shows a group of Ugandans viewing a screening of the KONY2012 film. This is an image of Joseph Rao Kony in southern Sudan taken by Stuart Price/ETA during November of 2006. The image is featured throughout the Kony2012 film and plays a central role in merging the idea of villainy and Joseph Kony. The image was also featured across a number of newspapers and online platforms that reported on Invisible Children’s Kony2012 campaign. The photograph has since became a core visual symbol of the Kony2012 campaign. 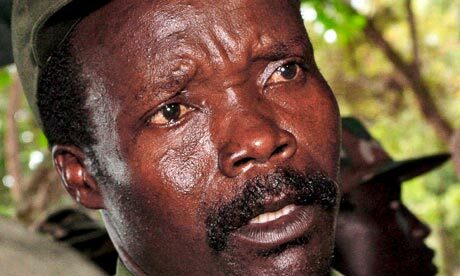 More on Joseph Kony here. Still image from Kony2012 when the director shows his five-year-old son a picture of Kony and the survivor Jacob and explains the situation in its most simple form. The above is a still image from the Kony2012 film by Invisible Children Inc.which depicts what is arguably the central,most symbolic moment in the video. This is the moment where the director shows his five-year-old son a picture of Kony and the survivor Jacob and explains the complex Ugandan situation is it’s most simple form. Some argue that forcing the audience to view the evil ‘black man’ through the eyes of a winsome, white-skinned, blonde haired child is playing on entrenched racial stereotypes while depriving Ugandans of a voice. KONY2012 Empowering or Misleading a Facebook Generation?